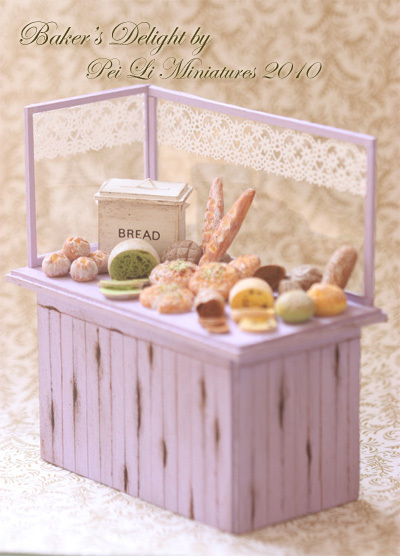 Dollhouse Miniature Food - Miniature Bakery Display in 1/12 miniature scale. Woodwork and bread are all entirely handcrafted by me. Painted in a lavendar lilac colour, I incorporated both an antique feel and romantic style to this piece, bringing you a weathered elegant miniature collectible piece that lasts forever. The bottom display shelf is a work of its own. To bring out the old antique feel, I textured and handpainted it to bring out the natural wear and tear of an antique furniture would age. 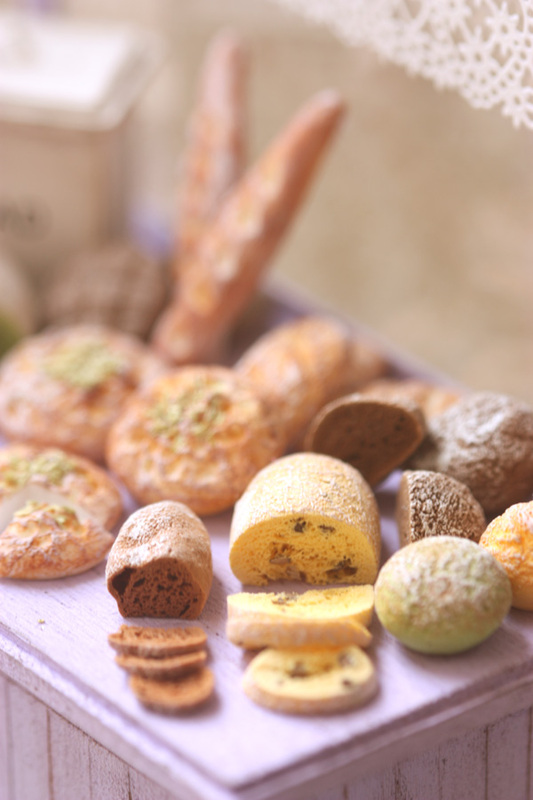 On the top of the display, I incorporated white lace adhesive seal on the window panes to give it a romantic style and imagining sunshine basking the breads in glory. The measurements for this is 9.7cm (length), 5.2cm (depth) and 10cm (height). All the bread are glued to the display shelf. There is so much to look at, and the highlight of this piece is in its attention to the finest details. I take pride in capturing the essence of realism in my miniature pieces. You will love the intricate and detailed design of this. This can be placed at the front of your miniature bakery shop window, or even if you don’t own a dollhouse or room box, collect it as a miniature art piece to display on your mantel. Item will be packed and shipped in a sturdy box.